What a game. Classic scores, crazy wides, indefatigable defence, inexcusable errors, nerves, guts, heroes, howlers, resignation, hearts-in-mouths, spills, skills and lots and lots of thrills. Like the GPO, it's the kind of game ten years from now everyone will be telling you they were at. 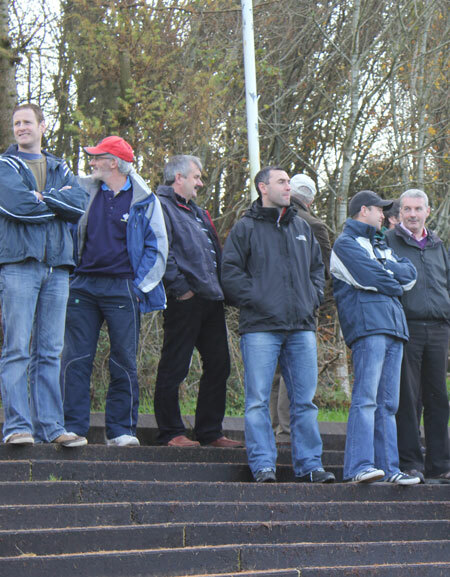 For the first 45 minutes the lads from the Lagan looked well in control. 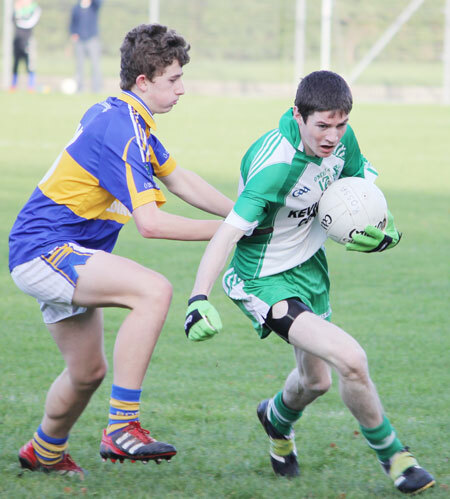 But when Aodh Ruadh got themselves back into the game in the final quarter the momentum swung from side to side right up to the final whistle in extra time. Cruel indeed it would have been for any side to lose. Both sides showed clear signs of nerves for the best part of the first half. 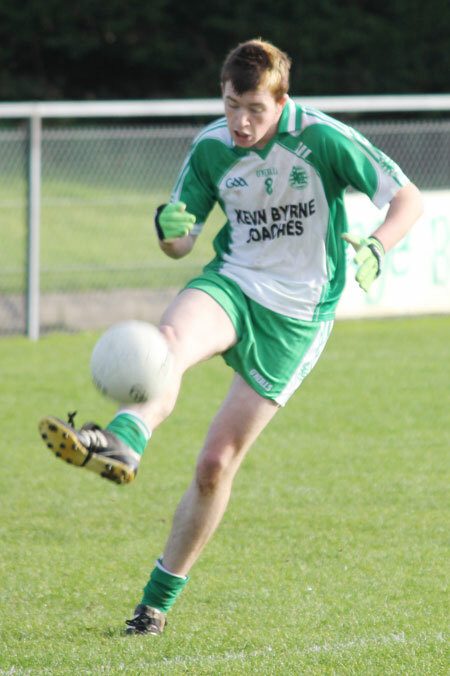 Despite that it was Aodh Ruadh who were first off the mark when David McGurrin pointed after an effort came back off the post. It was the first of a ten point haul for the Abbey Isle man. 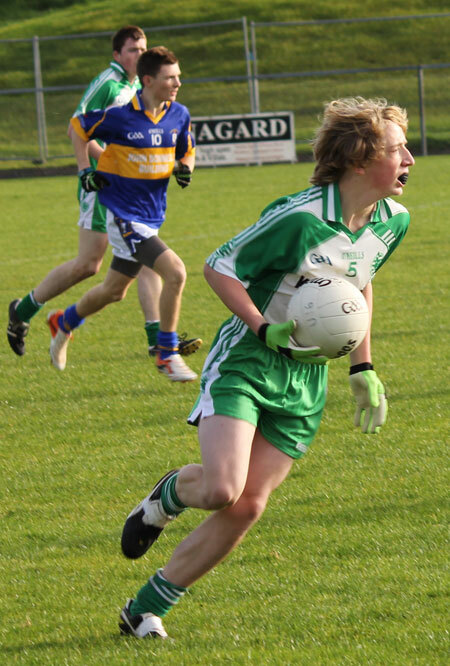 While Aodh Ruadh might have notched the first point it was O'Donovan Rossa who were quickest to settle into the game as a group. Chris McComish had already proved dangerous for the Antrim men in earlier rounds and he was in form again in the semi-final slicing over a quick reply to McGurrin's opener within a minute. 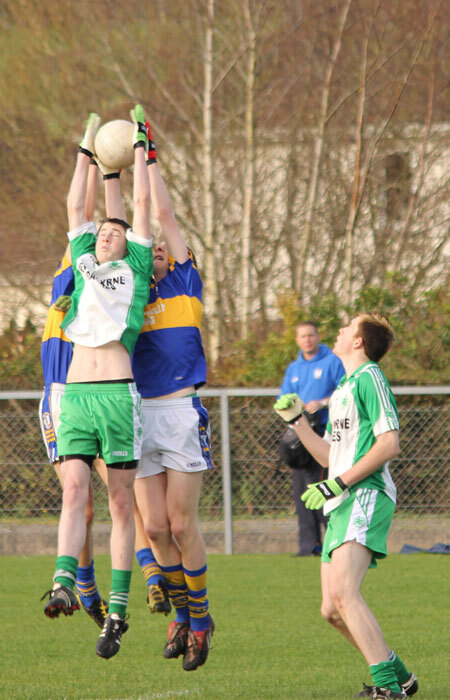 A couple of minutes later and the useful half forward had lofted over another to double Rossa's advantage. 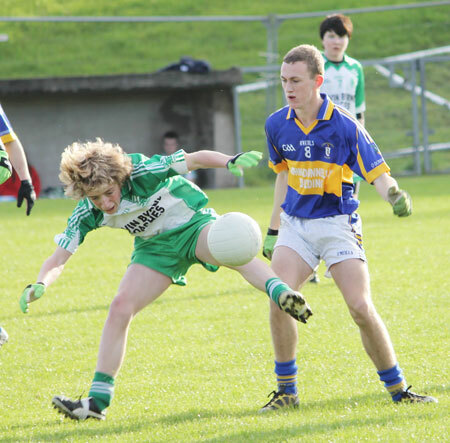 There was a short lull for treatment to the Lagansiders full back, Richie Gowdy. Unfortunately Gowdy couldn't continue and was replaced by Gerard Walsh. 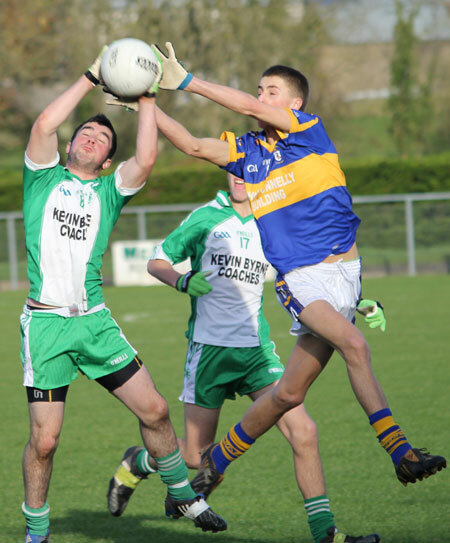 Rossa were sharper after the lull and signaled their intent when a high ball into the area from Sean Smylie was fisted just wide. The ball went back in a minute later and Gareth George looped a fine shot from right to left over Daniel Kelly to raise the green flag and put the scores to 1-2 to 0-1. Jamie McDonald almost fashioned an instant response as he advanced with malice on the Rossa goals, but his driven shot flashed over the bar. 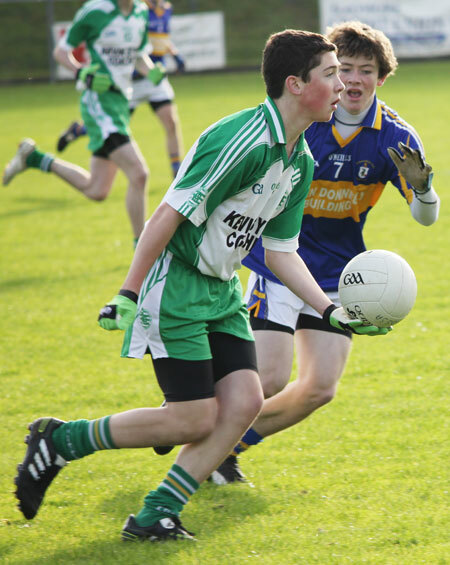 Aodh Ruadh won a free from the kick out. Intelligent play from free-taker David McGurrin saw the ball worked to Paddy Gillespie and he fired over to put two points between the sides. 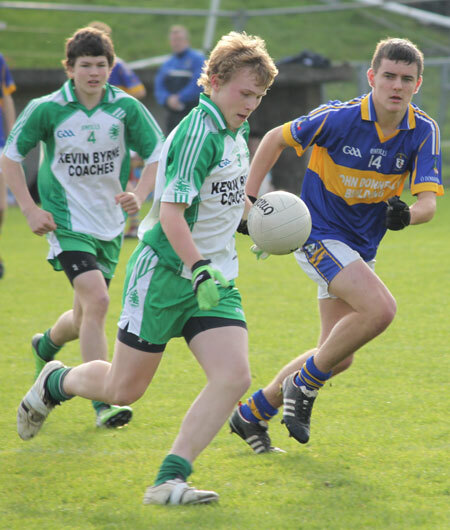 Nevertheless it was a O'Donovan Rossa who were playing the better, more controlled football at this stage. 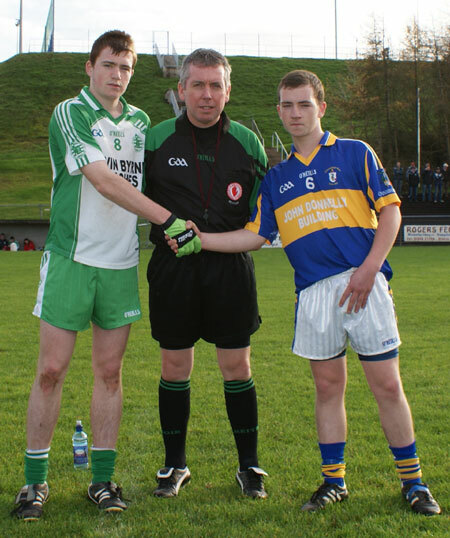 McComish hoisted over a good point, before Rossa won the kick out and James Connolly rifled over. 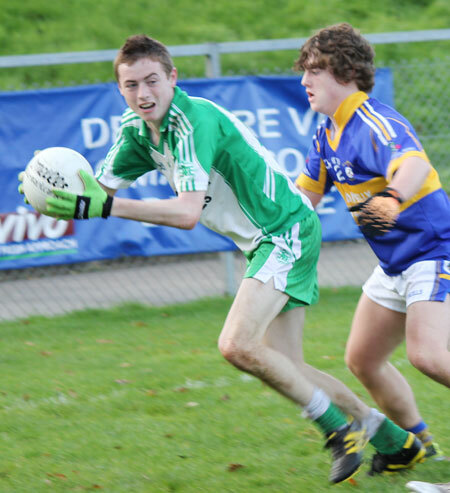 The Aodh Ruadh kick out malfunctioned critically once more and again Connolly found himself bearing down on goal. He hit a superb shot which described a path between the despairing hand of Kelly and the underside of the crossbar. 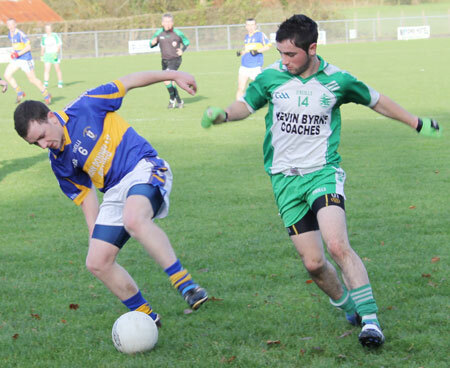 Rossa were now seven points to the good and full value for it too. 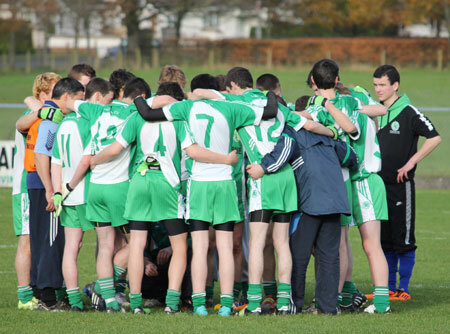 Aodh Ruadh looked shaken and unsure of themselves. James Kelly was let on with a great ball and the goal on, but he shot early and his attempt went over. With five minutes left in the half Rossa raked irrepressibly up the field leaving a trail of flailing Erneside arms behind them. Gareth George was once again the man on the end of the move having found space of the man. He made no mistake, drilling his shot low and hard under the body of the advancing Kelly. It looked grim for the Ernesiders, but there were a faint green shoots of recovery in the dying moments of the half when David McGurrin fisted over and then Jamie McDonald, struggling with injury at this stage, fired over a difficult point. Ballyshannon needed a good start to the second half. It didn't happen. Before the first minute of the half was gone McComish had once again slipped over another lovely left foot point. A minute later James Connolly did brilliant work to turn over a ball himself and then make up 15 metres before slotting his shot over with an economy of fuss. More silky play from Rossa saw Gareth George powering over his first point of the game and putting ten points between the sides. 3-7 to 0-6. Two McGurrin frees on 35 and 36 minutes already had the air of taking the bad look of things. But matters were shortly about to take a dramatic change for the better for the Ernesiders. 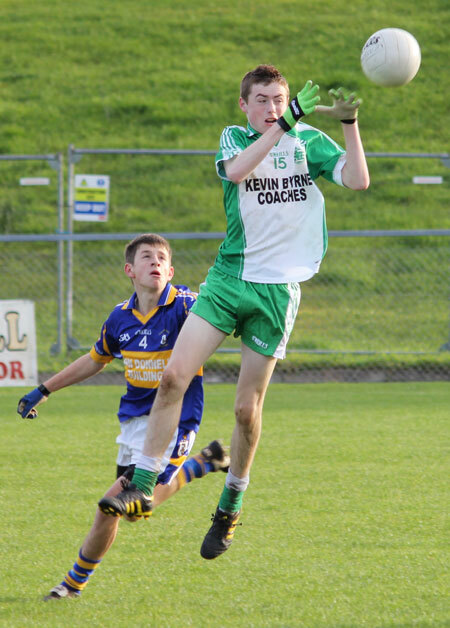 An Aodh Ruadh counter attack found a statuesque Jamie McDonald on his own between the 13 metre and 20 metre line. He pivoted, pulled the trigger and his precision shot left Domhnall Moran with no chance and the game back on. Ballyshannon continued to pressurise and on 41 minutes Rossa had to act fast to snuff out a goal chance, but McGurrin salvaged a point. The Lagansiders were a little rattled with the gap now back down to four points, but once again it was Gareth George who stood up to the mark, firing over a distance free from the ground with polished technique on 42 minutes. Aodh Ruadh now introduced Conor 'Schillaci' Gilmartin and he, along with earlier sub Niall Harley, was to have a pronounced influence in swinging the game back in the Ernesiders favour. 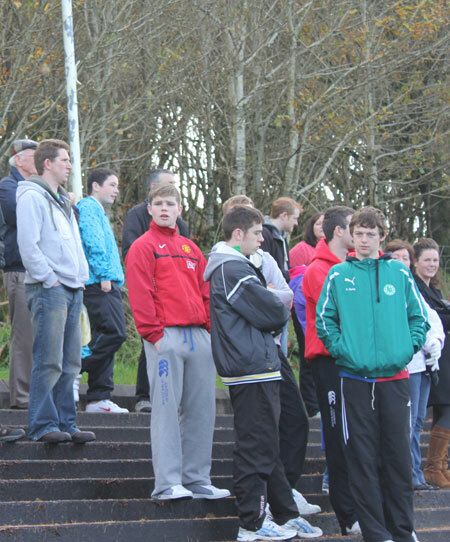 The next score came with 13 minutes left, a free from McGurrin, but the Falls Road men responded immediately. Deaglan Murphy was a lot quieter than his attacking colleagues in the forward line, but he showed impressive cool to execute his point. Rossa were unhappy with Conor Gilmartin's size and directness and he drew a penalty with ten minutes to go for a foot block. The offending defender was substitute Gerard Walsh who was already on a yellow card. He got his marching orders and the closing stages were tantilisingly poised. 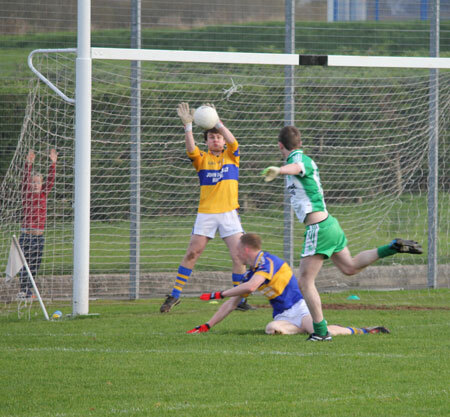 McGurrin stepped up for the penalty, but his shot came back off the left post and there were no Aodh Ruadh men alive to the rebound, allowing Rossa to clear their lines. McGurrin made some amends three minutes later when he hit another free. With six minutes left Jamie McDonald delivered another moment of audacious genius. 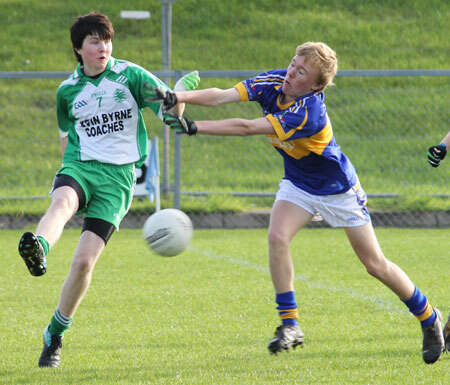 Collecting the ball out on the right he held his nerve to work a shooting opportunity and hit a searing shot past Moran to put a single point between the sides and send the Aodh Ruadh support into delirium. With three minutes left Conor Gilmartin again found himself with a shooting chance. The point might have been the option to take, but Gilmartin saw a chance to finish the game and backed himself. Unfortunately his shot fizzed just wide. As time ebbed away James Connolly and David McGurrin exchanged points. Connolly's effort a particularly classy long range effort. 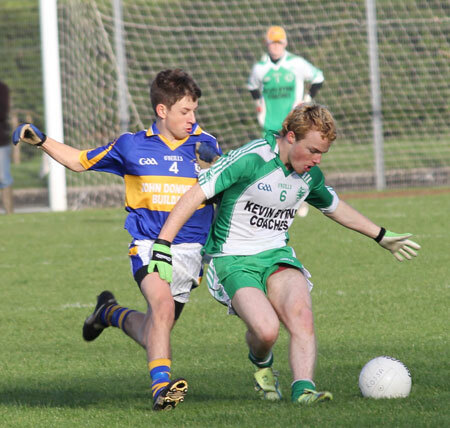 Rossa struggled after going that man down and it was Aodh Ruadh who were applying the preponderance of the pressure in the closing stages. It was appropriate that David McGurrin got the closing point of normal time. 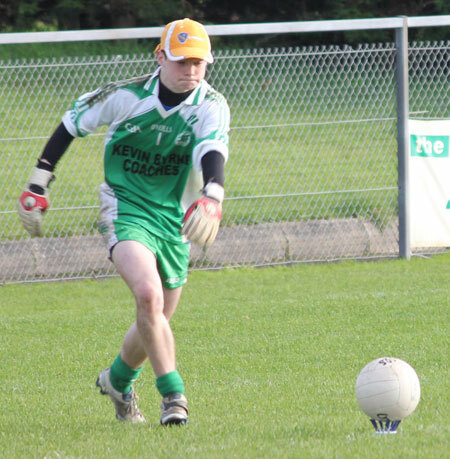 Aodh Ruadh won a free well out from the Rossa posts. McGurrin displayed his intelligence and accuity to hit a short free, develop a clear shooting opportunity and execute a calm, clinical finish to level the game. The momentum seemed to be with Ballyshannon for extra time, and that looked confirmed when a David McGurrin shot from distance just sneaked over the bar. However the pendulum swung back to the Belfast lads in no uncertain terms when Eamonn McGrath was harshly adjudged to have foot blocked in the area. Gareth George smashed home a magnificent penalty despite the best efforts of Daniel Kelly. 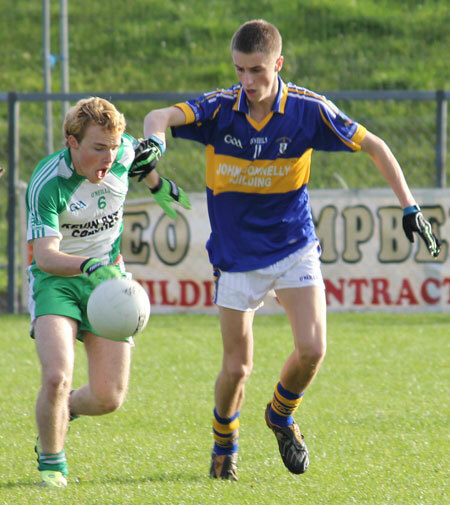 Padraig McGreevy was quiet for much of the game for Rossa, but he was to have a big say in extra time. He blazed over a good goal chance with three minutes of the half left, before George hit another beauty of a point to give the blue and gold a four point cushion and seemingly set fair for the final. 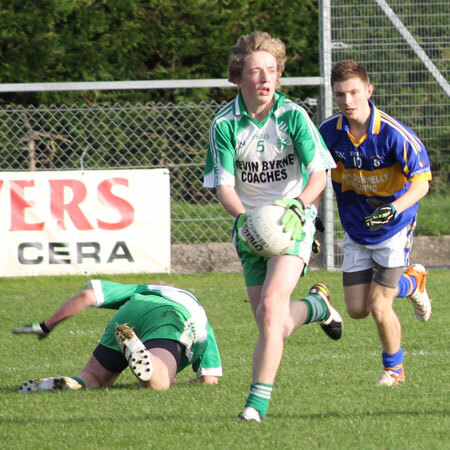 Up stepped Pauric Patton. In the dying seconds of the half he won possession near the half way line. Even at that early stage he seemed to have just one thing on his mind. 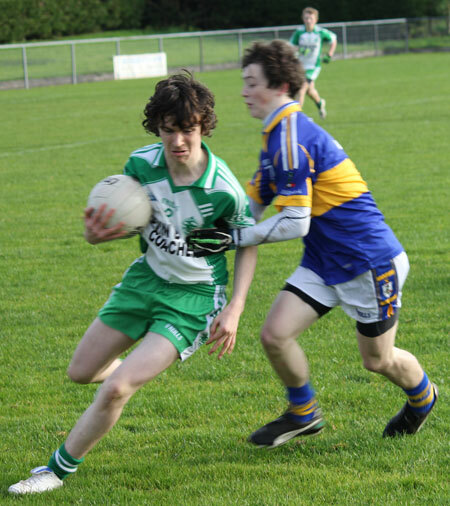 His blistering pace left his marker flailing after him and as he romped forward the Rossa defence seemed to open up for him. A more mentally fragile player might have looked for an option, but Patton was a man on a mission and he crashed an unstoppable shot past Domhnall Moran for what was score of the game in every sense. 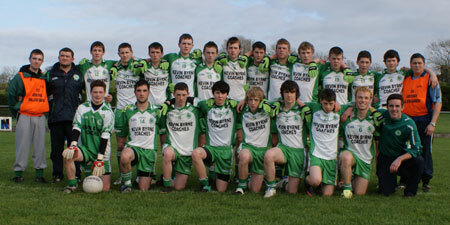 Aodh Ruadh were a point down at half time in extra time. The game was most definitely still on. 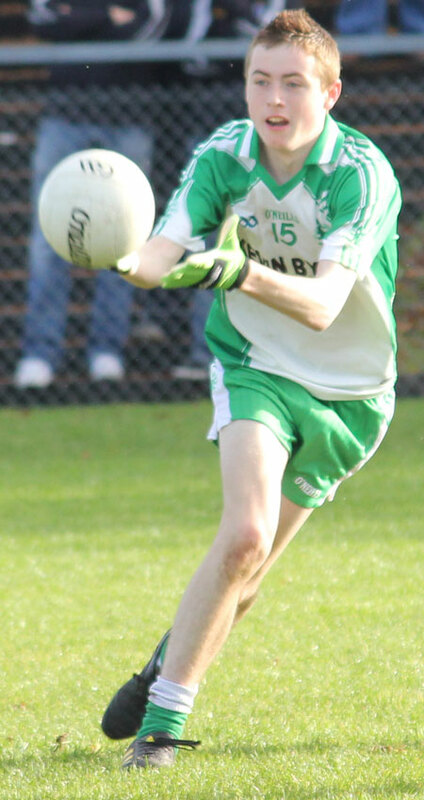 O'Donovan Rossa had enjoyed a lot of green flag success from balls dropped into the danger area. Two minutes into the second half of extra time Ballyshannon finally got the chance to try a similar approach. A shot was put out for a 45. The place ball was floated speculatively in and Johnny Gethins, who had a quiet game by his high standards, was clinical in dispatching the opportunity. It was a two point game going down the stretch. The closing stages were a toe-to-toe heavyweight contest. Five minutes into the half the Aodh Ruadh defence once again opened up for McGreevy, but once more his shot flew over, rather than under the bar. 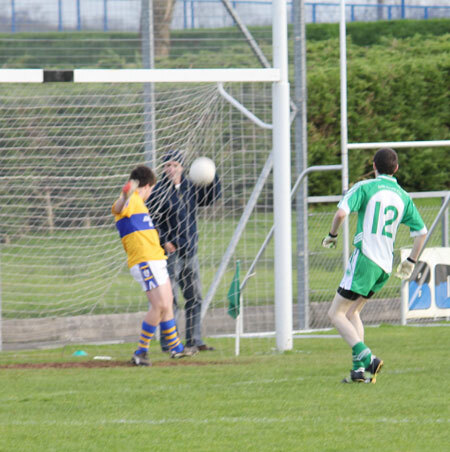 With three minutes left and Rossa desperately trying to find the leveler it fell, inevitably, to Gareth George. He hit a majestic pressure point to tie the scores at 4-14 apiece. The final few moments were nerve jangling for both sides, but when Eugene McConnell blew the long whistle there can't have been too many in Dromore who doubted it was the fairest result, a fact vindicated by the sustained standing ovation both sets of fans gave the exhausted players afterwards. It was a game strewn with exquisite skill and some fearful errors. It was also a game where a number players who will doubtless be featuring for their counties in years to come stood up and weren't found wanting. For O'Donovan Rossa Gareth George was phenomenal, two goals and three points were only part of the story as he tortured the Aodh Ruadh defence for long periods of the game. Beside him James Connolly was just as lethal in the full forward line. Chris McComish was another great finisher and a very natural footballer with it. The Rossa midfield of Sean Smylie and Callum McVeigh were an excellent pairing and gave the Belfast side a great platform to build on. 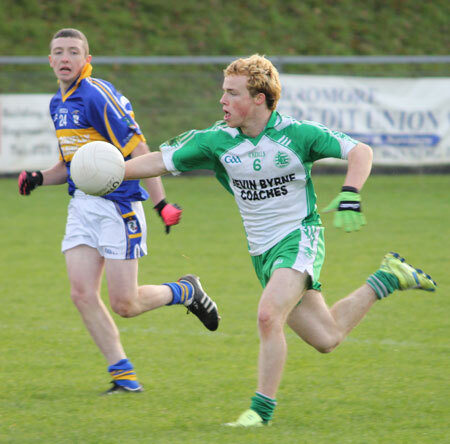 For Aodh Ruadh David McGurrin's ten point haul is hard to look past. He might have missed a penalty, but he was central to driving on the Ballyshannon challenge, rousing the Ernesiders after every point and playing with an unquenchable passion and conviction. Jamie McDonald played through the pain barrier and in that context his two goal, two point haul is an even more impressive achievement. 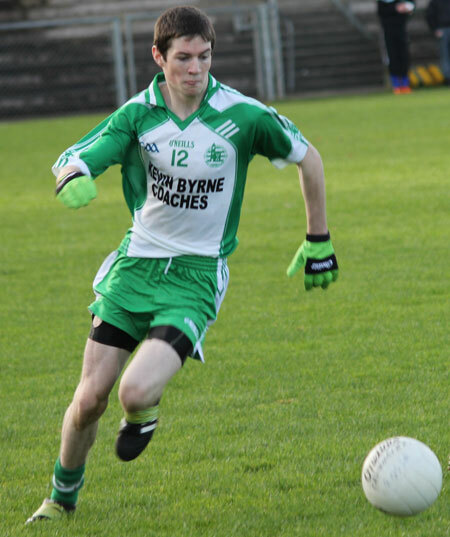 Eamonn McGrath staunched the flow of goals when moved to full back at second half and his authority played a huge part in restoring Aodh Ruadh's confidence. Ryan Patton seemed to flourish more at half forward. Matthew Maguire had a fine stint in the corner, and substitutes Niall Harley and Conor Gilmartin both made hugely positive contributions on introduction. But it would be impossible to ignore the contribution of Pauric Patton. 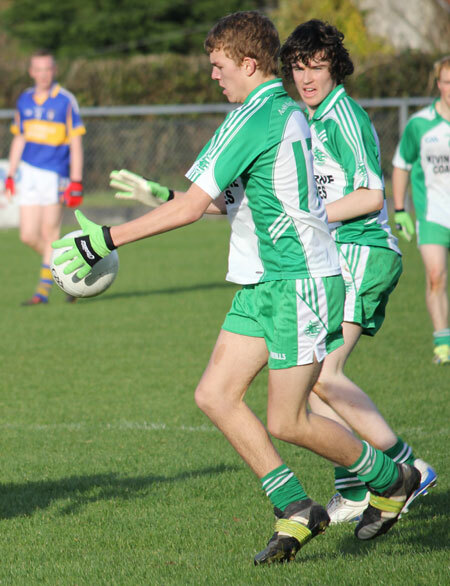 Just when it was most needed his reading of the game helped Aodh Ruadh get traction. With his footballing brain, assured hands, frightening pace and laser-guided passing he was an invaluable asset. Apart from that the sight of him ripping down the wing on his way to goal spreading panic in his wake is a vision that will live long in the memory. A phenomenal game of football played largely in good spirit between two accomplished set of footballers. The next installment promises to be every bit as thrilling. Daniel Kelly; Matthew Maguire, Ryan Patton, Colm Kelly; Patrick Gillespie (0-1), Pauric Patton (1-0), Matthew Gettins; Eamonn McGrath, Darren Gethins; James Kelly (0-1), Michael McNeely, Johnny Gethins (1-0); Eddie Lynch, Jamie McDonald (2-2), David McGurrin (0-10, 4f). Yellow Cards: Darren Gethins: 45 minutes, Jamie McDonald: 52 minutes; Eamonn McGrath: 65 minutes. Management team: Shane Ward, Gregory Sweeney and Chris Kelly. Domhnall Moran; Sean Emmet Shannon, Richie Gowdy, Stephen Gaskin; Niall Devlin, Nathan Early, Aidan Orchin; Callum McVeigh, Sean Smylie; Chris McComish (0-4), Padraig McGreevy (0-2), Chris Boyle; James Connolly (1-3), Gareth George (3-4, 1f), Deaglan Murphy (0-1). Substitutes: Gerard Walsh for Richie Gowdy: 7 minutes; Conal Boomer: Half-time, Sean Emmet Shannon; Daragh Rocks, David Quinn, Fionn Mulvenna. Yellow Cards: Sean Emmet Shannon: 25 minutes; Conal Boomer: 32 minutes; Gerard Walsh 35 minutes and 50 minutes; Sean Smylie: 46 minutes; Niall Devlin, 51 minutes; Callum McVeigh: 61 minutes. Red Cards: Gerard Walsh: 50 minutes - second yellow.